Burial and Final Expense Insurance | Assurance Partners Ltd.
People who have lost a member of their family know how difficult it can be. The emotions are overwhelming. Often, there isn’t enough time to grieve because you need to begin to deal with the financial implications. The costs of a funeral can add up quickly. The last thing you or your family needs to worry about is if you will be able to cover the expenses.That is why planning ahead is critical. Burial insurance, or final expense insurance, is a basic life insurance policy that typically covers people until they reach the age 100. 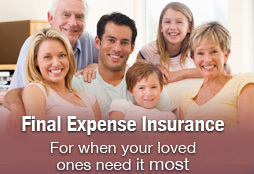 It is easy insurance to obtain, and very affordable. Depending on the policy, burial insurance or final expense insurance helps your family cover the expenses of a funeral and other outstanding expenses. Besides a sense of security, final expense coverage offers never changing premiums and permanent coverage, making it a wise decision for your future. These costs can quickly add up, making burial insurance a smart and pre-emptive decision. Don't make your loved ones worry about costs when the only thing they should be doing is grieving. YOU CAN APPLY FOR A FINAL EXPENSE POLICY WITHOUT SPEAKING TO ANYONE AND NO MEDICAL EXAM RIGHT NOW. CLICK THE PICTURE TO APPLY IN 10 MINUTES AND RECEIVE YOUR POLICY WITHIN 10 DAYS OF ISSUE BY MAIL.